One of the most impressive structures in Milan, the Duomo Cathedral stands proud in Piazza del Duomo. The massive cathedral has been standing for more than 600 years. Its long and interesting history is just as equally intriguing as the church’s architecture. There is so much behind the Duomo’s elaborate façade which will entertain any visitor to no end. Why is the Duomo Milan Cathedral so Important/Famous? What is the name of the Duomo in Milan? Why Was the Milan Cathedral Built? What is the Milan Duomo Rooftop? What to Expect at the Duomo Milan? You’ve Visited the Duomo Milan, What Now? The Duomo Cathedral for a variety of reasons. It is one of the most important buildings in Christendom and also one of the most recognizable because of its distinct architecture. The fifth largest church in the world, it also has a staggering number of sculptures. Amazing architecture, not seen anywhere else. It is probably the largest and most complex Gothic building in the world. It houses what is said to be one of the three nails used in the crucifixion of Jesus Christ. The full name of the Duomo in Milan is the Basilica CattedraleMetropolitana di Santa Maria Nascente. The Duomo is the fifth largest Catholic church in the world, covering an area of 109,641 square feet, which is almost an entire city block. It has 3,400 statues, 135 gargoyles, and 700 figures. To fully appreciate the architecture, you have to climb the stairs or take the elevator to the rooftop. The cathedral is 158 meters long, 92 meters wide, and 108.5 meters tall. It can accommodate about 35,000 people. The Duomo’s construction officially started in 1386 under the instructions of Bishop Antonio di Saluzzo. It was also supported by the ruler of Milan, Gian Galeazzo Visconti who envisioned a grand cathedral. Although construction originally started with using terracotta stone, Condoglian marble from Maggiore was eventually used once they realized the grandeur of the project. The cathedral was consecrated in 1418, however the Milan Cathedral wasn’t completed for centuries. The façade was finished during Napoleon’s reign and he also jumpstarted the final stages of construction in the 19th century. The cathedral was built because the Archbishop and the new Lord of Milan wanted to build a structure that would make people marvel at the glory of the God. It was also built to showcase the power of the city of Milan. Visitors can enjoy unrivaled amazing views of the city of Milan for a nominal fee by going to the rooftop using the stairs or the lift. There are two lifts going to the rooftop and 6 stone stairways. There are 33 stone bridges that crisscross two side of the roof, connecting the different sections. Walking on the rooftop of the cathedral lets you see the city from different perspectives. You will have a close encounter with awe-inspiring carvings and pinnacles that the experience can be likened to walking through a forest of delicate marble. There is one statue that towers above all else on the rooftop and it is said that it must always be the highest in Milan, the golden Madonna, which is the symbol of the city. 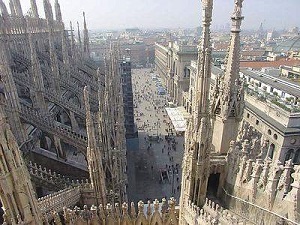 From above, you will be able to see the Piazza del Duomo with its stunning be beautiful geometric decorations. The square’s design, as well as the magnificent buildings surrounding it date back to the second half of the 19th century. On a clear day, you will also be able to see the Stazione Centrale train station and even get a glimpse of the Alps. When in Milan, it is a sin not to enter the cathedral because it is the beginning of any visitor’s journey to the city. An even more popular attraction than the inside of the famous Duomo is the cathedral’s spire-laden roof. Visitors can expect admiring the intricate details of the cathedral’s architecture, as well as the spectacular vistas of Milan when they step on the rooftop and take witness the city of Milan. However, because the Duomo is one of Milan’s top sights, visitors can also expect a throng of people jostling for space and wanting to experience every little detail of the world-famous church. However, the experience is all worth it. The Duomo is the fifth largest Catholic church in the world, only outdone by the St. Peter’s Basilica in Rome, the Basilica of Our Lady of Aparecida in Brazil, the Cathedral of St. John in New York, and Seville’s Cathedral. The Duomo boasts of the most statues than any other building in the world. The Duomo has the best views of the city of Milan. The Duomo took more than six centuries to construct. The church has five naves, a central nave, and two lateral naves on both sides, resting on 40 columns, with each column measuring 24.50 meters. The roof of the Milan cathedral is open to tourists for a nominal fee. The roof can be accessed through 6 stone stairways and two elevators. The interior of the church features a substantial collection of artworks, the most famous being the statue of St. Bartholomew, one of Jesus’ twelve apostles. The church has several large windows with stained glass, three of which that are located in the apse of the cathedral are the highest in the world. The cathedral stores a nail from the Crucifixion of Jesus. It is placed at a spot in the dome above the apse, marked by a small red light. Various events of importance have taken place in the cathedral, including the famous Edict of Milan in 313, and the coronation of Napoleon in 1805. The entrance of the cathedral is on the front side, facing the cathedral square. The building has a total of 6000 sculptures. The Duomo is not only a church but also a cathedral because it is the residence of Archbishop of Milan. The cathedral lacks a visible bell tower. Although they are not visible, they exist. The construction of the Duomo is responsible for the Navigli, the city’s canal system. There are several ways to get to the Duomo. Please note that children six years old and under get free admissions, as well as people with disabilities and their helpers, and military personnel in uniform. Designed in the Gothic style, which was at the peak of its glory, the Duomo Milan has the same style as the Notre Dame in Paris. 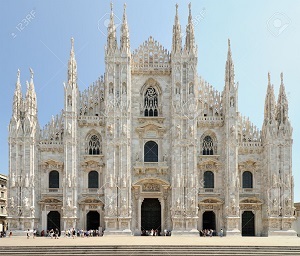 Milan has always been considered an international city because it is the crossroad between Southern, Northern and Western Europe and the church’s international Gothic style seemed apropos. Although the church took centuries to build, the builders maintained their devotion to the international gothic exterior. The style is characterized by height and dramatic ornamentation. There are more than 3000 statues in the church and thousands of individual spires. The tallest of the spires is 354 feet tall and it supports a gilded statue of the Virgin Mary, called la Madonnina which was built in 1774. Tradition dictates that la Madonnina must always be the highest human-made object in Milan. As a matter of fact, when a new building surpassed the height of the Duomo, a replica of the la Madonnina was made and placed atop. The gothic roofline is popular for its dense grid of pinnacles and spires that are supported by flying buttresses. The cathedral also has 90 gargoyles. 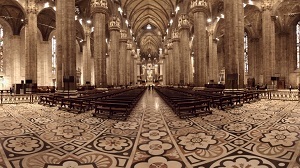 The plan for the interiors of the Milan Cathedral is in the shape of the cross and is modular and its dimensions are based on a repeating unit. There are two side aisles along each side which is a departure from the usual single aisle. This gave the cathedral more space and afforded it a row of clerestory windows. If you are going to Milan, it is important that you plan your visit well, so you do not waste time and money. When to visit. The best time to visit Milan are April to May or September to October. The spring and fall months are the peak season for tourism, however, you will be able to avoid the sweltering heat of the summer months. Be prepared for the throng of tourists though. Know the opening hours. Aside from the Duomo, there are various other places in Milan to see. You can also take a Milan to Venice day trip or a trip to other places, if you have the time. Check a map of Milan attractions to see what other places and attractions you can go to and check out. When visiting Milan, you will also want to explore the Duomo. The cathedral in the center of Milan deserves more than a glance from the outside. Here are a few tips to make your experience an unforgettable one. Plan. Aside from the Duomo, there are plenty of other free things to do in Milan, so plan well to avoid wasting your time, money and energy. Purchase tickets in advance. Do not waste time in line. Get instant access and start exploring as soon as you get there. This is especially helpful if you have limited time and want to see as much as you can when in Milan. Buy the right ticket. Unlike other cathedrals, the Duomo does not have a standard ticket. This being one of the largest cathedrals in the world, guests need different tickets to access various areas of the building, as well as nearby attractions. Do a little research so you do not end up buying the wrong ticket and wasting your money in the process. Read up. It pays to at least read a brief history of the city and its many attractions before going there. For example, if you plan to see the painting of the last supper. It is helpful to read Milan Last Supper painting facts to at least have an insight of this wonderful work of art. Although you may have a guide during your tour, you may be too busy being amazed by the exquisite pieces that you are no longer paying attention to your guide. The Duomo Milan is one of Christendom’s holiest and most popular sites and millions of people flock to Milan every day to gaze at it and to discover the many sculptures and works of art inside. 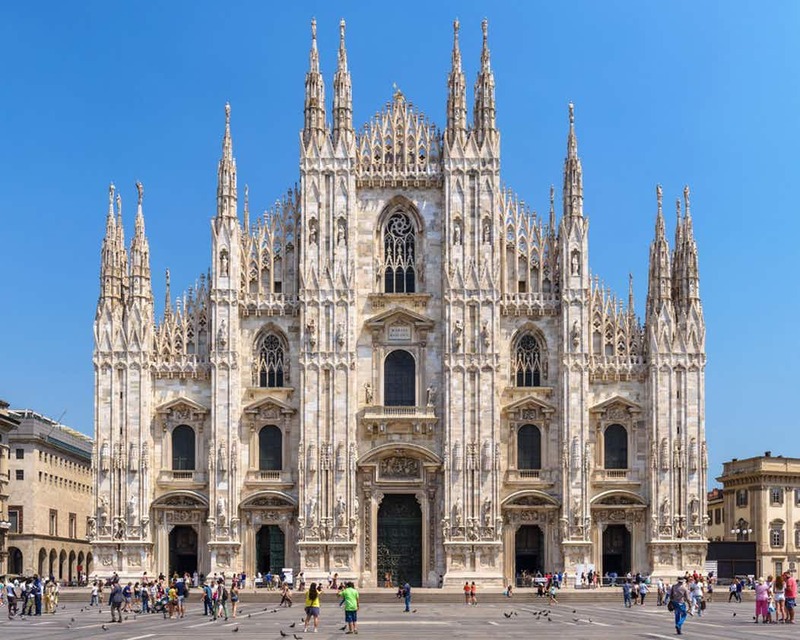 We have taken the liberty to do the research for you and have come up with this top 10 list of Duomo Milan tours and tickets. First stop by the tour operators desk and exchange your voucher for a entrance ticket, then head to Piazzadel Duomo, sail past the queue and begin looking around the 27 rooms of El Grande Museodel Duomo. The Cathedralit self is the base for the Archbi shop of Milan although it was originally built in the name of Santa Maria Nascente. Inside you can find richly decorated tape stries, human sculptures and beautiful stainedg lass windows. This ticket also gives you access to the remains of Santa Tecla, a form erpaleo christian church, as well as St Giovannialle Fonti Baptistery, but the real highlight of a visit to Milano Duomo is the panoramic city views from it sterraces. 50 metres above Piazzadel Duomo, is where youget the best view, whilst standing amongmar blegargoyles, statues and a 14 ft high goldens culpture of The Virgin Mary. This combined ticket to Milan Duomo and Terraces is the ideal way for history and art lovers to visit Milan's number 1 attraction. Once inside you caneither rent a multilingual audio guide or wande round at your own speed, there's no time limit, aside from closing time ofcourse. Entrance to Milan Duomo, including the Duomo Terraces, Museum, Archaeo logical Site and Churchof St. Gottardo in Corte. 10% discount at the Duomo gift shop. Discover the most significant landmarks in Milan on this 2-hour guided walking tour. Witness the beauty of the city as your guide leads you through the history, the culture and the traditions of the city. Start with a visit to the greatest opera house in Milan. La Scalais known as one of the most extraordinary opera and ballet the aters and has hosted the best singers and artists from all over the world including Giuseppe Verdi, Gioachino Rossini, and Arturo Toscanini. Looking out from the boxes, admire the amazing interior of the theater, with its magnificent audit or iumand stage. Head to the Galleria Vittorio Emanuele II, one of the main shopping streets in the city and is known to be one of the oldest shopping malls. The tour starts from the visit of the Archaeological Area, where it will be possible to find out about the remains of the Baptistery of San Giovanni and the Basilica of Santa Tecla (4th Century). The visit continues inside the Cathedral. Secrets are hidden with in the highwalls of the Duomo. It took five centuries to complete the Duomo and the resultis an extraordinary combination of forms, where white marble became the protagonist and the interpreter of Lombard Gothic style. During the visit you will have the opportunity to learn small and big mysteriesin side the Cathedral of Milan. The visit ends on the suggestive terraces of the Duomo from where you can admire the wonderful panorama of the city and enjoy a breath taking view. Become a donor to preserve the Cathedral’seternal beauty and get a free gadget. Skip the lines at Santa Maria delle Grazie with your priority access to admire Leonardo's Last Supper (if option selected), and at the Gothic Duomo and the magnificent Churchof San Maurizio. On a program divided into morning and afternoon sessions, your guide will take you on a journey through time from the medieval Mercanti Square to the Church San Satiro, with i tstrompel'o eil perspective, to the provocative L.O.V.E. sculpture by Maurizio Cattelan. Take a leisurely walk along the fashio ncapital’sposh Via Montenapoleone and Via della Spiga, and enjoy the elegant atmosphere of Galleria Vittorio Emanuele with it smany boutiques and cafès. Dream of operas and ballets in front of world-famous La Scala Opera House and imagine what it must have been like to live in the imposing Sforza Castle, home to intrigues and backs tabbing. The capital of Lombardy, Milan is one of the world’s leading sites when it comes to fashion, commerce, arts, education and of course, tourism. If you have time to spare, it is a good idea to not only enjoy the sights in Milan, but also neighboring places. Here are a few day trips which are worth taking. Lake Como has gained popularity in the last few years due to the number of Hollywood stars acquiring property there. One of the deepest lakes in Europe and one of the most attractive in Italy, Lake Como is surrounded by natural beauty which will take your breath away. Cinque Terre is another region in Italy which has made it on countless top places to visit in Italy list. Cinque Terre means five lands and it includes five villages, namely; Monterosso al Mare, Manarola, Vernazza, Riomaggiore, and Corniglia. A city that has been celebrated in Shakespeare’s Romer and Juliet, Verona is a place that celebrates love. One of the seven provincial capitals of the region, it is one of the main tourist destinations in Italy and has also been declared a World Heritage Site by UNESCO. St. Moritz is one of the world’s most beautiful resorts and it is situated in Switzerland’s Engadin Valley. It hosted the Winter Olympics in 1928 and again in 1948. It is an area well known for polo tournaments which are placed on the frozen lake. During summer, it is a training base for runners, cyclists, and race walkers. Venice is renowned for its canals and its gondolas. It has no roads, but it has 150 canals, which makes it truly unique. The main attraction of the city is the Grand Canal, lined with 170 Renaissance and Gothic buildings, St. Mark’s Square, St. Mark Basilica, and the Venice Opera House. Italy does not have a shortage of spectacular sights and beautiful cities to visit and Milan is one of the country’s most renowned cities, which must be experienced at least once. One of the city’s highlights is the Milan Duomo and there are many ways to experience it. Visitors can go on the Milan hop on hop off bus, or get the Milan Pass which is a ticket to some of the most popular sites.